In post five of this series, we encouraged you to share your peerwith.expert URL. Let us know if/when you do it, so we can boost the post by sharing it too, retweet, like, etc. 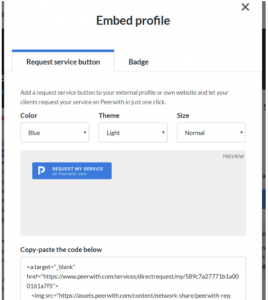 At Peerwith, we feel strongly about empowering experts, which is why we created http://peerwith.expert/, where experts can receive direct service requests. 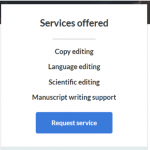 The Call-To-Action (CTA) on each peerwith.expert page is the “Request service” button that allows your clients to request your service in a direct request. A direct service request means no other experts are in the conversation between you and the client: it’s just you! The service fee for direct service requests are at the low percentage of 12% (instead of 20% for most categories in an open service request). Let’s take a look at that button. We made it easy for you to share this button and link on any external profile page, homepage or your own website. You can add the request service button anywhere you like! Look on peerwith.expert for “Embed your profile” in the top right corner. Noticed that little button? Click to open a modal dialog with two options: “Request service button” and “Badge”. 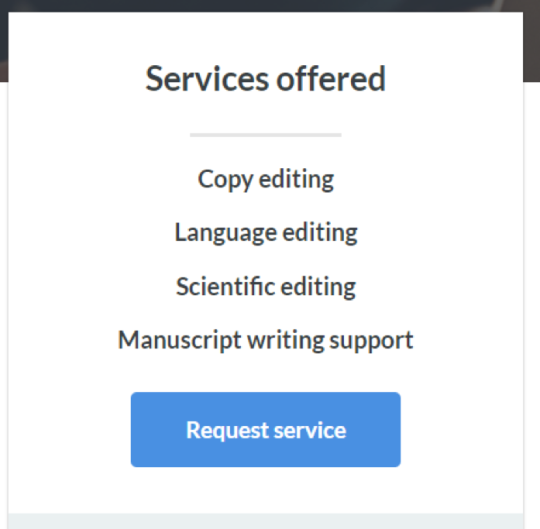 Lets take a closer look at option one, the “Request service” button. You can set the color of the button, theme and size. The preview shows what the button will look like if you embed it. If you are happy with what you see, copy-paste the code below. Now go to your other profile page, website or homepage. You probably have some sort of Content Management System (CMS). Look for options to “embed” code or copy-paste HTML code. Use that, copy-paste the code from Peerwith and you are all done. 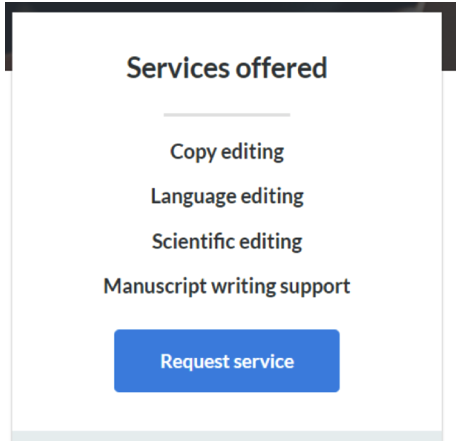 The result shows the Request service button on your own website with a link directly to the Request my service page on Peerwith. Add transaction capabilities to your own website or homepage, embed your profile and let Peerwith deal with the rest. In the next blog post, we will teach you how to share your expert rating on other channels.